so my wife broke her foot and it is in a large cast up to her knee. she can't balance on crutches so I bought an electric wheelchair. the manual wheelchair tires her out .she has throw rugs all over the house and it is hard to roll. anyway she is still active and I seen her out spraying weeds and taking care of her 2 acre yard. now a few days later she is outside it's 90degrees out and gets stuck. 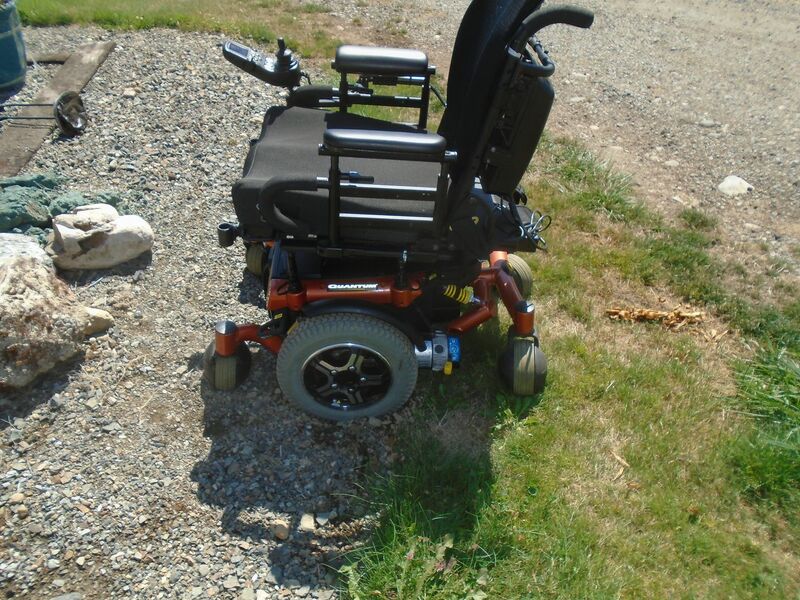 I mean the wheelchair wheels are spinning in the gravel and not moving. I am inside eating lunch and don't hear her screaming . i'm use to her being outside. she has a 911 call alert type of button the VA gave her. carries and doesn't want to push it. she is a vet. am I correct that she should have pushed the button? 911 answers just like a phone and you talk to them. she crawls around the house to the back door and smashes something on it to get my attention. this is the chair stuck in the gravel. oh, she is out picking tomatoes today in it. I removed the leg things and headrest that she didn't like. If she has a cell phone, she should carry that with her. If not, I'd recommend a small air horn. Something like this. I keep these around and use them for similar situations when I need to get someone's attention. I don't blame her for using a chair. No shame in it. I've been considering getting one though I don't think I need a power chair. I just want something for when we travel. Would be less hassle than a scooter in stores and such.